Can you still call a band progressive if it seizes upon a formula and then spends its time improving on it rather than striking out, and actually progressing? As a genre, ‘progressive black metal’ fits German trio Secrets Of The Moon just fine, but Seven Bells doesn't reflect a great deal of progression from 2009’s very good Priviligivm. However, what is immediately clear is that Seven Bells does reflect improvement, being a damn good album - loosening the militaristic control of before to allow for a slightly broader if still very mid-paced and exacting approach. As ever expert in their atmospheric build-up and use of astonishingly heavy, crushing doom riffage, Secrets Of The Moon are the farthest yet from those cheap Satyricon comparisons that have dogged them in the past, not least from me. What strikes you first and foremost is the intensity, songs like Serpent Messiah having a genuine emotional drive to them that becomes of an altogether different note when you realise the man, the myth, the legend Tom G Warrior himself handled production duties here. That heartfelt heaviness seems to become closer to recent output from Triptykon the more you listen to it, and the album is steeped in the dark quality associated with the Frosty legend. The bells of the album title are repeated throughout, often at the beginning of a song in a kind of ritualistic way, heralding each new lengthy opus (all but two songs are over seven minutes, three being over nine). 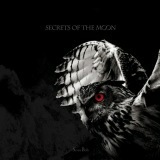 It’s good to notice that Secrets Of The Moon are better than before than rocking out, the likes of Worship indulging in fast, headbangable riffage as well as extremely catchy slower choruses, and the following Nyx has a clear, chugging hook between the occult, melodic meanderings. Songs generally have much better flow than in the past, holding your attention for the full running times - it's certainly the best album to date from Secrets Of The Moon, and if I've not scored it accordingly it's due to overscoring albums in the past. Ultimately, it's difficult to see where the band are going to take this in future, but further refinement of the formula will probably lead to a good score and more praise from me down the line. They fit a niche, and make enjoyable metal, and do so well.